Although some of Team USA’s flights were delayed, everyone will arrive safely. As I sit here writing this note, my excitement for the 2015 Pan American Maccabi Games is reaching a crescendo. The 2003 Pan American Maccabi Games, which I attended, were also held in Santiago. The Estadio Israelita Maccabi (EIM), which is the main hub of these Games, is as beautiful and organized as I remember. Competition begins tomorrow for many of the USA Teams, and it will be hot one, so be sure to stay hydrated. We have a dedicated medical and athletic training staff… hydrated athletes will only make their jobs easier! 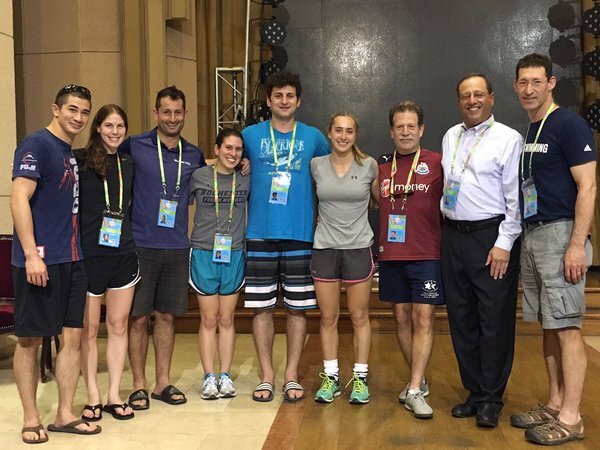 Let me remind everyone that the Pan American Maccabi Games are about strengthening Jewish identity, forming lasting bonds with fellow Jews from the USA and abroad, and creating lifelong memories. Sports are merely the vehicle by which we accomplish these objectives. It has been my privilege and pleasure to serve as the Maccabi USA Chair for these Pan American Maccabi Games. I look forward to the upcoming competitions and witnessing the “Magic of Maccabi” occur in Chile! Please stay tuned as we keep you up-to-date on all that we are doing over the next week plus. Don’t forget to follow us on Facebook, Twitter and Instagram. Congratulations to Adam Moyerman, Lauren Greenberg, Dallen Stanford, Erica Gelb, Ross Rosner, Ellie Greenberg, Don Kent, Jeff Bukantz, Tom Pereles, Sal Litvak & Michael Monheit, who were chosen to be the Flag & Banner bearers for #TeamUSA at the Opening Ceremony of #PanAm2015! Not pictured are Sal Litvak & Michael Monheit. While we are in Chile, we will be posting pictures, results & updates regularly on our social media platforms. Follow us on Facebook, Twitter & Instagram, and don't forget to use our official Pan American Maccabi Games hashtags, #TeamUSA & #PanAm2015. We may even run a contest or two!